This is, at least, a new idea and concept for a story, and Kim Nguyen’s latest film is not like anything else you’ve likely encountered before. The acting is largely superb, with Jesse Eisenberg, Alexander Skarsgård, and Salma Hayek getting lots of time and space to chew scenery and build complex characters. Tech savvy folks have likely never had a drama about running a 1,400 mile fiber optic line across the country before, so Huzzah!!! - this is the movie for you! Densely plotted and written, The Hummingbird Project can be a chore to sit through. The movie is a bit of a mess and struggles to find a tone to engage with. Is it a dark comedy? Thriller? Corporate drama? Personal and emotional drama? Underdog story? All of the responses to those questions is “Yes” - and that’s kind of the big problem. Only the most dedicated are going to stick this out. At 110 minutes, The Hummingbird Project hangs around way, way too long. Watching thousands of movies in my lifetime, I am not sure I have ever encountered a drama about running fiber-optic lines across the country before. So, in that sense, Kim Nguyen’s new film, The Hummingbird Project, presents us with a new idea of how to tell the corporate business story of plucky upstarts realizing their dreams. 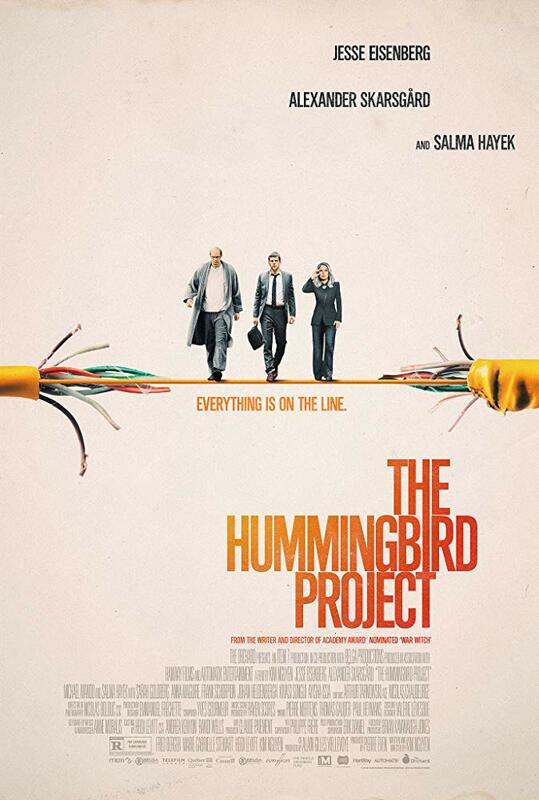 We have seen traces of this story before with The Hummingbird Project’s star Jesse Eisenberg, who forever memorialized Facebook founder Mark Zuckerberg with his Oscar-nominated turn in 2010’s The Social Network. 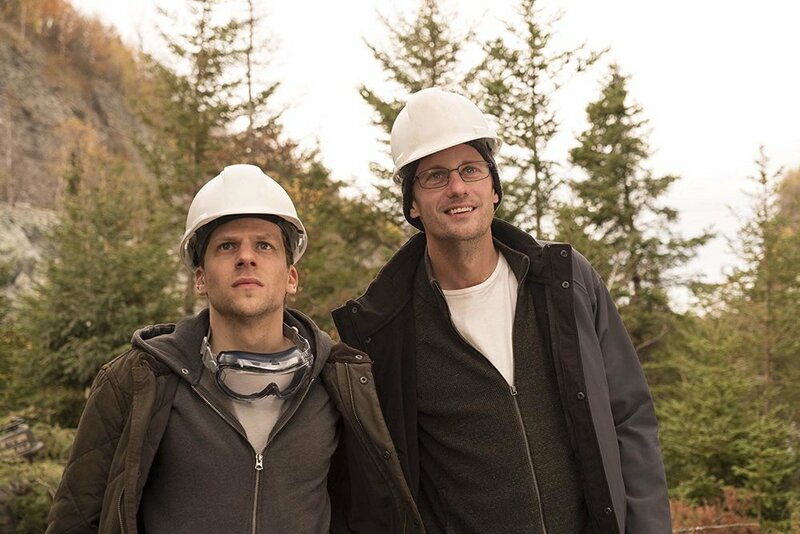 Eisenberg slides comfortably into the role of Vincent Zaleski, who along with his cousin Anton (Alexander Skarsgård), hopes to become innovators in digital technology. Vincent is the wheeler and dealer, while Anton is the brains behind the operation. Their fiber-optic plans seems solid enough in concept: Run a line from Kansas to New York City, a straight line which allows for the transmittal of data at a somewhat faster rate than what is currently available. If successful, the breakthrough could revolutionize the way data is transferred and set the cousins up financially for life. Obstacles surface almost immediately however. For starters, to run a straight line will prove costly and challenging, requiring the opting-in of homeowners and landowners across all 1,400 miles of the prospective path. Legal issues abound with adverse possession, eminent domain, and the feasibility of this entire endeavor is called into question at every turn. The cousins hire an engineer (Michael Mando) to assist with the logistics and, with him in place, Vincent is out wheeling and dealing, trying to make the impossible dream become a reality. Interesting, but often impenetrable, The Hummingbird Project creates a cinematic conundrum every second it plays before you on screen. On the one hand, the film is rich with acting prowess, including a great supporting turn by Skarsgård, and Salma Hayek, who plays the Zaleskis former boss who targets them in her crosshairs once they resign from her company. Nguyen clearly has a zeal in which he writes this dialogue and how he constructs his story and he clearly has things to say about how our eagerness to push ourselves to do great things can come at great physical and emotional expense. But who exactly is this made for? The Hummingbird Project is saddled with such opaque dialogue and technical jargon that the film becomes laborious to sit through at times. Clearly, there is some genius-level research and thought put into the ideas Nguyen has come up with. And though it feels as if an article, short story, or full-fledged novel would provide the source for such material, this is an original concept and screenplay of Nguyen’s creation. I was reminded, at different moments, of the experience I had watching 2011’s Atlas Shrugged: Part I, the unapproachable adaptation of Ayn Rand’s controversial manifesto. While The Hummingbird Project is in no way controversial, and a far better film than Atlas in almost every way, it carries the same obstacle of barring off general audiences who are committed to trying to participate in the story. Nguyen feels so far in the weeds on this at times, I simply threw up my hands and just waited for scenes to finish before I tried to reconnect with the stakes at play here. One emotional twist midway through the film resonates more than anything else in the film, because Eisenberg hooks us with a response and decision we can connect with. However, Nguyen continues slicing and dicing his way out of a thicket of his own creation, resulting in an over-plotted final act that keeps us craning and reaching to find some way to care about much of anything going down by the conclusion of the film. The Hummingbird Project is ambitious, well-acted, but difficult to embrace. As intensely as it flits around and flaps its wings, this is one hummingbird that never really finds a direction it wants to go. By burning and wasting a lot of pent-up energy, the end result is a rather disappointing, exhausting journey that leaves us largely disconnected observers to a journey we never truly feel a part of in the first place. Starring: Jesse Eisenberg, Alexander Skarsgård, Salma Hayek, Michael Mando, Jonah Heldenbergh, Sarah Goldberg, Ayisha Issa, Frank Schorpion.